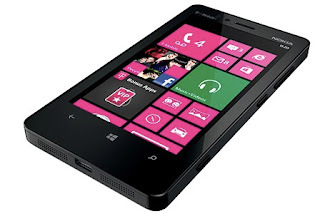 Nokia and T-Mobile , a week ago, unveiled a surprise for us – The NOKIA LUMIA 810, a variant of the Nokia Lumia 820 for AT&T supporting the HSPA+ 4G service. The 810 is not a small phone by any means: the bezels are large, the corners much squarer, and the thickness is noticeable. It's 11.2mm thick, according to T-Mobile, 1mm thicker than the 820. The Lumia 810 comes in both black and cyan colours. The back cover is removable and can be swapped with any colour. Each cover will include the necessary facilities for WIRELESS CHARGING. The smartphone sports a 4.3 inch-ed clear black AMOLED capactive multitouch screen display with a resolution of 480 x 800 pixels. It will be powered by a dual core 1.5 Ghz processor bundled with 1 GB of RAM and 8 GB of internal storage. It has an impressive 8 MP camera at the rear featuring Carl Zeiss lens and dual flash. Not to forget, it has also has a “SKYPE-CERTIFIED” 1.2 MP Front facing camera. It runs on the Windows 8 OS featuring Nokia Music and Nokia Maps, in addition to the Nokia CityLens augmented reality app, and Nokia Transit. The 1650mAh battery would yield the Nokia Lumia 820 14 hours of talk time. On the whole, The Lumia 810 is a good phone. There is no firm release date but it should coming on T-Mobile before the end of this year. Keep reading for more updates. 0 Respones to "Nokia Lumia 810"